The Lancet, has published four major review papers on the Worldwide Obesity Epidemic that has finally identified passive over-consumption of calories as the major cause of the global obesity pandemic. This followed the publication of a major British Study on Tackling Obesities: Future Choices. People throughout the world are getting heavier simply through normal people making a normal responseto an abnormal environment. The food we eat now is calorie dense, and when we eat normally, we passively consume too many calories. Additionally the our meal and portion sizes and meal frequencies (snacks) have increased dramatically. So we eat more, we eat more often, and what we eat is full of fat and calories. Is it any wonder that most of use are getting fat and there is a world wide obesity epidemic? To put it another way, obesity is the result of people throughout the world responding normally to the obesogenic environment (fatness promoting circumstances). The term obesogenic comes from 'obese' plus the ending '- genic', and refers to things tending to generate or lead to obesity including food, eating patterns and lifestyle. The West has exported its foods and lifestyles to the developing world where the rise of obseity there mirrors the increase in affluence. The people getting fat as those who can afford the western foods and lifestyles. Genetics and body form loads the gun for obesity, but it is the obseogenic environment that pulls the trigger.Government intervention is urgently required to change the obesogenic environment (food and lifestyle) in which we live. People need to be able to eat normally and not get fat. This is beyond personal choice and self-regulation in the food industry. 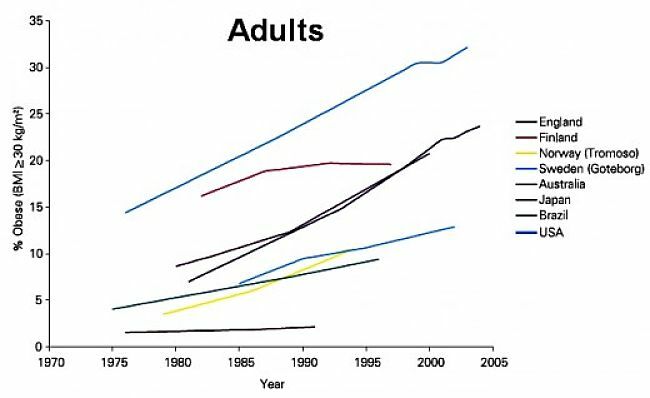 The rise of the obesity rates occurred simultaneously in the 1970s and 1980s in most developed, high-income countries (see the images). 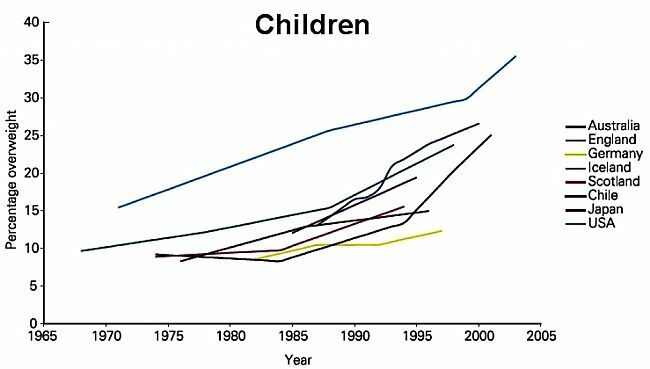 After the 1980s many middle-income and low-income countries started to show increased obesity rates in both adults and children, mostly in the most affluent groups. By 2008, about 1·46 billion adults throughout the world were overweight, with a body-mass index [BMI] exceeding 25. BMI is defined as body weight divided by the height squared. Of these about 502 million adults were obese with BMI greater than 30. About 170 million children, aged less than 18 years, were classified as either overweight or obese. In some countries more than 25% of all children were overweight. 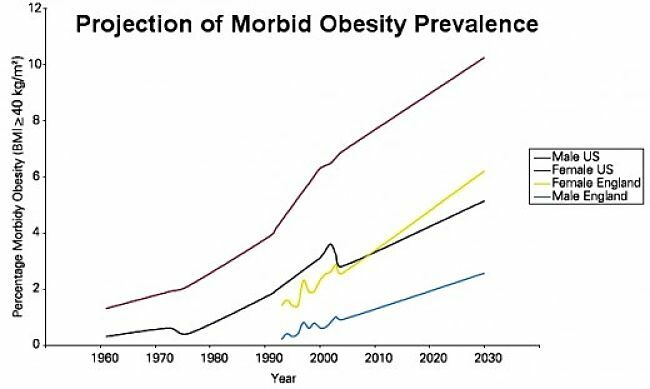 Why has the obesity epidemic occurred over the last 40 years? There is a predictable pattern in various populations that helps to explain the cause. In high-income countries obesity affects males and females of all ages, but is much worse in disadvantaged groups. In the United States obesity rates are higher among people low socioeconomic status who have less choice where and what food to buy. In cities they have fewer places to exercise and neighbourhood safety concerns often restricts exercise. Obesity is also higher in middle age people who are generally more affluent. In low-income countries, obesity is mostly prevalent in middle-aged adults (especially women) from wealthy, urban environments, who can afford to buy the western foods and can adopt western lifestyles. In low-income and middle-income countries, groups of high socioeconomic status in urban areas tend to be the first to have high obesity prevalence. These groups can afford the high-calorie processed foods exported from the West. Obesity becomes more prevalent to the poorer groups and rural populations as a country's gross domestic product (GDP) increases. The most obvious reason for a population to become overweight and develop obesity is sufficient wealth and changes in food supply and calorie density of processed foods. Research has shown a positive relationship between GDP and mean BMI up to a GDP of about US$5000 per person per year. 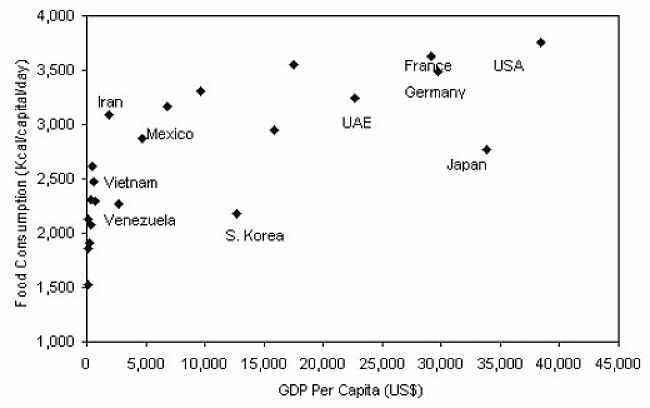 The image below shows GDP per capita in US dollars against daily calorie intake at 2003 levels. In general, the more affluent countries have a higher calorie intake with the The Middle East (UAE) an obvious example. 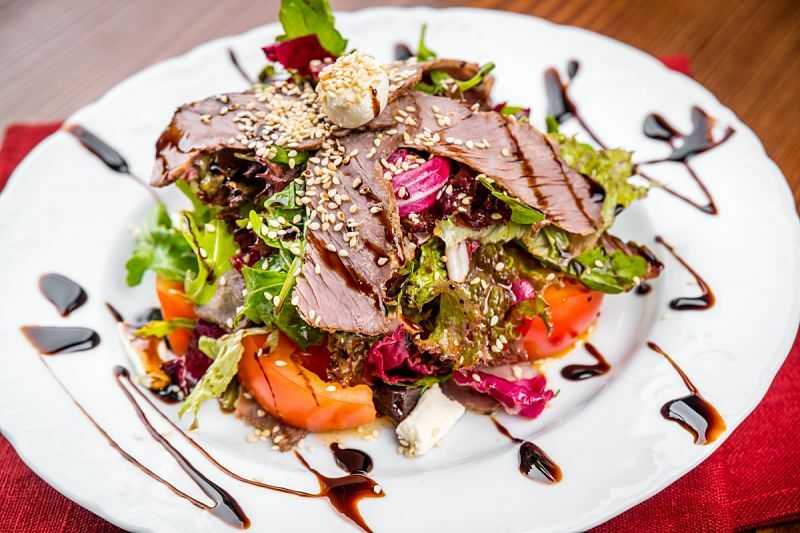 Healthier diets in affluent countries such as Korea and Japan are exceptions. This suggests that as emerging countries become wealthier, their populations consume more calories and get fat. But different cultures and body shapes respond in different ways, and at different level of prosperity. In some low-income countries, such as Pacific Island Nations, obesity prevalence is very high, while affluence is low - but western foods, such as soft drinks are prevalent. The trend reverses in Western countries (see images below). In England, for most ethnic groups, people earning less have higher rates of obesity than those in higher socioeconomic groups (using manual (red) and non-manual professions). The only exceptions were in Pakistani, Indian and Irish males. The differences were much more prominent for females. The highest prevalences of overweight and obesity are in middle-age groups (45 - 59 years) throughout this transition process, probably also driven by increases in affluence. There are encouraging reports are emerging from countries such as Sweden, Switzerland, France, and Australia, that overweight and obesity prevalence in some childhood age groups might be flattening or even decreasing. However it remains a major problem for middle age people. 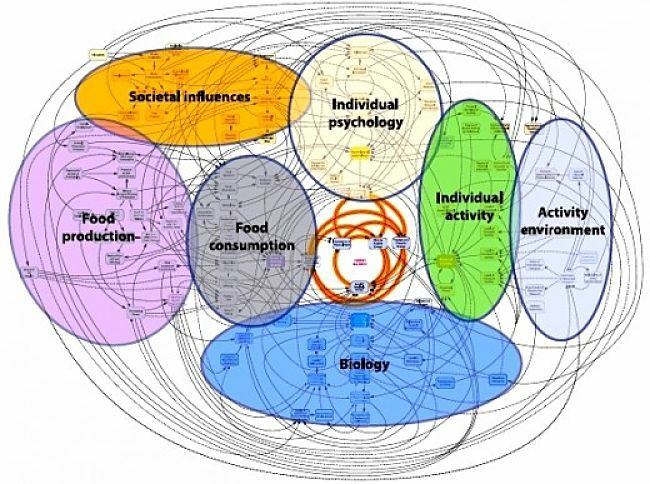 The main driver is changes in the global food system linked to affluence - food is affordable and is more widely available and this has led to passive over-consumption of calories. More of our food is highly processed, crammed with fat and calories. It is easier to obtain as fast and convenient foods, and is more effectively marketed than ever before. Several studies have confirmed that increases in the food supply are the dominant drivers of the weight gain in populations in the USA from the 1970s, and in the UK since the 1980s. The export of processed foods to developing countries and the promotion of western lifestyles coincided with the increases in obesity in these countries as well. Many countries have adopted western diets, western foods and soft drinks and western lifestyles leading to obesity. The 1970s saw a marked increase in the amounts of refined and processed carbohydrates and fats in foods which was mirrored by a rapid rise in portion sizes and the available calories. Energy intake and the number of calories eaten increased because of obesogenic environmental push factors, such as easily available, inexpensive, tasty, highly promoted, weight-gain promoting foods. These foods were exported to many undeveloped countries along with western lifestyles. A decrease in food energy supply (postulated to be pulled down by reduced energy expenditure requirements for daily living). This was the the so-called 'move less, stay lean' phase from 1910 to 1960, characterised by decreasing physical activity levels and energy intake levels. Industrialisation and mechanisation changed lifestyles, people exercised less, but they also ate less and the population remained lean. 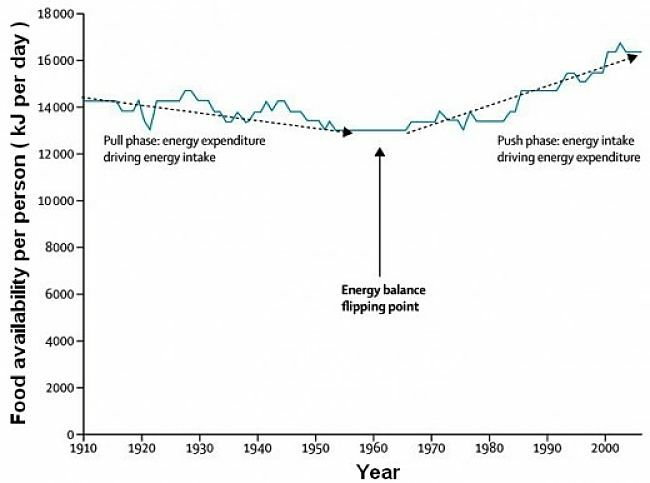 An energy balance 'flipping point' is proposed in the 1970s (see image). The food industry saw the opportunity for growing new markets and developing new products to help the working mums - mass-produced highly convenient foods that were tasty and appealing to the palate. The promotion campaigns pushed these foods the children - "Good on you Mum". The foods were rich in sugar, calories and fat, substances that humans are destined to crave by their biology and evolution. In the 1940s and 1950s most meals were prepared and eaten at home, even when both parents worked. There were no vending machines dispensing candy and soda, and no fast-food emporiums or shopping malls with food courts. Nor were we constantly bombarded with televised commercials for prepared foods and drinks laden with calories of fats and sugars. Eating out was a special event. "Convenience" foods were canned fruits and vegetables, not frozen lasagna or Pizzas. A typical breakfast was hot or cold cereal sweetened with raisins or fresh fruit, not a Pop-Tart, jelly doughnut or 500-calorie bagel with 200 calories of cream cheese. Women were spending a lot less time on food preparation, but the industry figured out ways to make food more readily available for everybody. The industry made it easier for people to consume more calories throughout the day. This tipped the balance towards gain in weight and obesity. It is the food that made us fat. 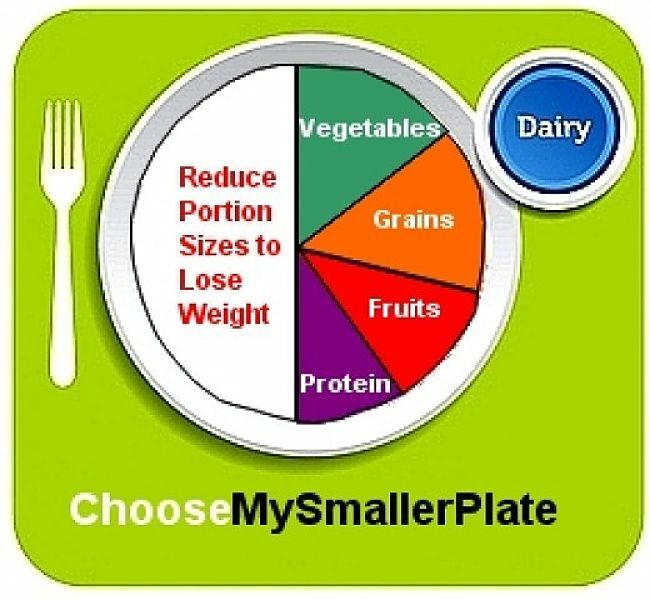 Given the change in the food supply and available environment and the growing tendency to eat bigger portion size, bigger meals and more often, the tendency to overeat can be regarded as passive rather that active. People eat too many Calories because they are unaware of the high Calorie content of foods and are simply doing what everyone else does. Overeating is simply a normal response to the environment in which we live. People consume too much food energy because the calorie density of the food has increased. When high-calorie food are available and affordable people simply eat too many calories. Over consumption of food and Calories is a passive response to the food-rich environment in which we all live. Appetite physiologists label this response as "passive over-consumption". In Western societies, the active overeating is usually driven by promotion and marketing. Over consumption can become the habit or norm in a society. Many visitors to the United States are often surprised by the huge portion sizes that are dished out at food outlets, even before the common 'U Size Me', but US citizens accept it as the norm, and this is part of the problem. The energy and fat content of many servings and meals fat exceed the normal single serve energy requirements of individuals for a given meal. In fact a single combo meal with fries and a soft drink or a shake may even exceed a person's entire daily energy and fat quota for a normal diet. Such meals are very cheap and are marketed as a snack and are widely use as 'cheap' meals by the poorer sections of society. This may contribute to the higher obesity rates in poorer groups in developed countries. The study also found that Governments have largely abdicated their role for tackling obesity to non-governmental organisations, individuals, the private sector and voluntary guidelines. However the study suggests that the obesity epidemic will only be halted if governments provide leadership, regulations, investments, adequate monitoring, and research. A major change in the fat prone environment in which we live, is required and only Governments can do this. The various guidelines and strategic plans have not produced major actions. Most food policy recommendation have been successfully opposed by the food industry including universal including front-of-pack traffic light labelling systems. Unlike other epidemics and health problems such as tobacco abuse, smallpox, and many infectious diseases, no country has introduced public health measures that have worked to reduce weight gains and obesity rates in their populations. The epidemic continues unabated. Obese people are dying early. Excess weight is a huge burden on the health systems, but no substantial direct action has occurred. Again the Lancet study confirmed what everyone who has dieted or tried to lose weight already knows - It is hard to Lose weight and it takes a Long, Long Time. The increase in weight with age appears to be inevitable. A study of 4,769 runners, aged from18 and 50 years showed an average male gained about 3.3 pounds ( 1.5 kg ) per year and about 3/4 inch around the waist every 10 years. The runners gained weight, almost irrespective of the number of miles they ran every week. The added weight built up. In the less than 30 years of age group of runners, about 20 % were moderately overweight after 10 years. In the 45 to 49 years age group, about 30 % became overweight. The study concluded that the only way to offset the seemingly inevitable weight gain is to run a lot more as you get older. Lengthening the running distance by about 1.4 miles per week every year was required to offset the weight gain expected during middle age. Runners who average about 10 miles per week when 30 years of age should more than double their weekly distance to about 24 miles by the age of 40 years, if they want to maintain their original weight. The Lancet study suggested that to return the average weight of Americans to 1978 levels, would require a sustained energy intake reduction of about 250 Calories a day for the average person. The reduction for obese adults, with BMI of 35 or greater, it would have to be about 500 Calories per day. It is going to take a long time. The Lancet study also showed that the advice given by nutrition and health organisations of the likely rate of weight loss is a myth and is far too optimistic except for extreme diets. This guideline stated that reducing of food intake by 2 MJ per day (480 Calories) will lead to a steady rate of weight loss of 0·5 kg (1.1lb) per week. Every 100 kJ per day ( 25 Calories) reduction in energy intake in food will lead to a loss of about 0.5 kg ( 1.1 lb ) in a year and 1 kg (2.2 lb) in 3 years. The loss of weight is generally a very slow process with only half of the weight loss occurring after about 1 year and the rest in about 3 years. This is equivalent to 10 Calories per pound of weight change or 20 Calories per kilogram over three years. 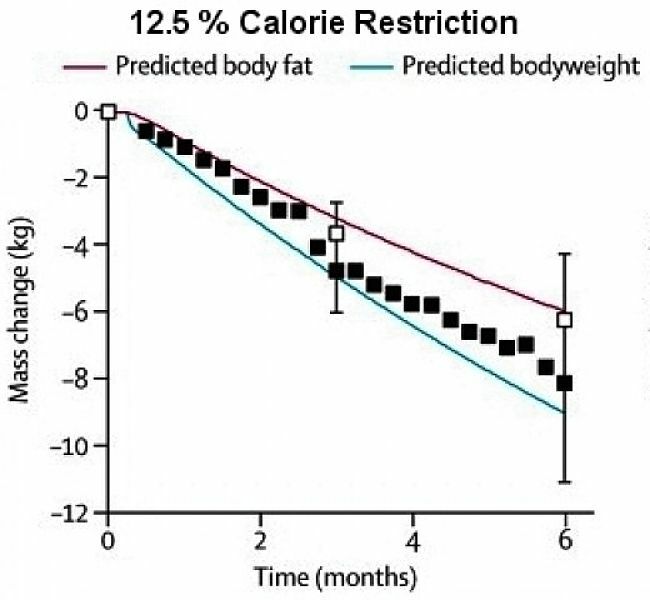 To lose 10 kg (22lb) in a year would require a year of dieting with a calorie reduction of 500 Calories (about 25% of the recommended daily intake). Keeping this reduction up for three years would double the weight loss. 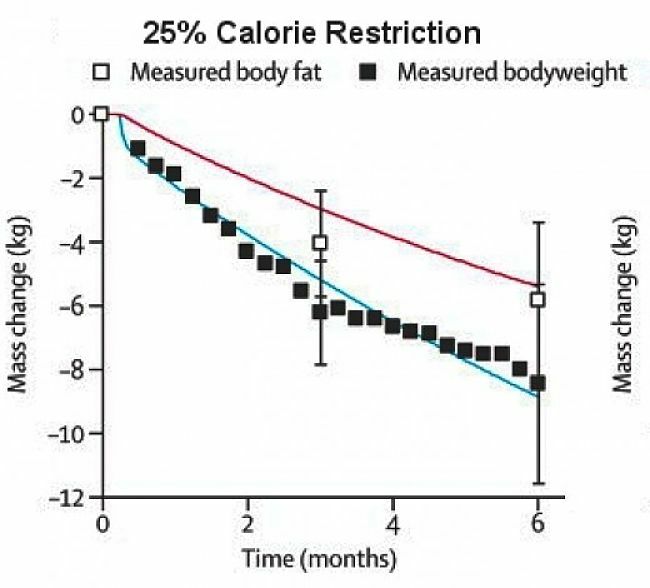 Below are comparisons of actual weight loss records for various Calorie reductions and the model predictions.